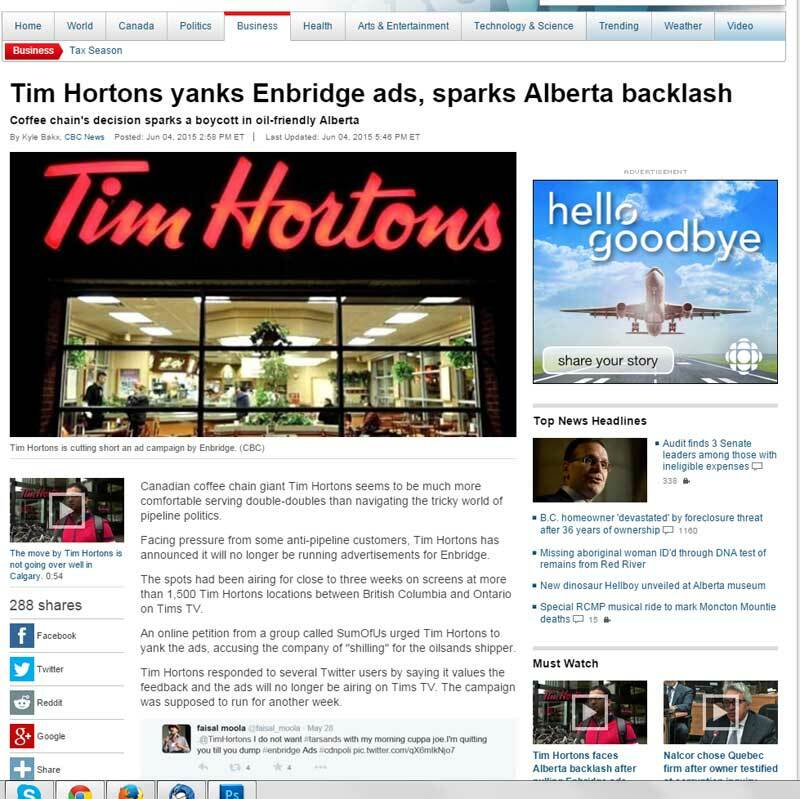 The headline on Thursday’s CBC.ca coverage of the sudden controversy over a boycott in British Columbia of Tim Horton’s over the Enbridge ads sums up everything that’s wrong about media coverage not only of the boycotts, but of northwest energy and environment issues overall. 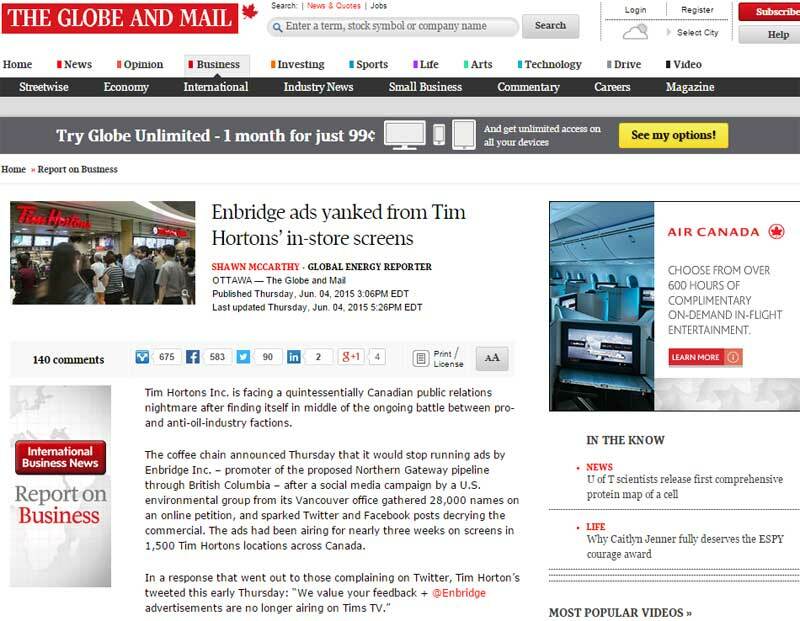 “Tim Hortons yanks Enbridge ads, sparks Alberta backlash.” The anger at Tim Hortons across northwest British Columbia over those Enbridge ads, the calls for a boycott have been building for more than two weeks but no one in the media noticed despite widespread posts on Facebook and other social media. As usual, the concerns of the northwest didn’t really become a story until Alberta got involved and the story has become the “Alberta backlash.” Now, there’s a backlash on social media to the Alberta backlash, with northwestern British Columbians tweeting and posting their displeasure, angry at the usual blinkered views of Alberta-centric coverage of energy issues. Let’s make one thing clear– despite the outraged cries of the usual suspects like Defence Minister Jason Kenney, Conservative MP Michelle Rempel, who represents Calgary Centre-North and Kyle Harrietha, the Liberal candidate for Fort McMurray-Cold Lake that the boycott was aimed at Alberta’s entire energy industry and the province’s views of a manifest destiny as an energy super power, the doughnut boycott was really aimed specifically at Enbridge, and the company’s arrogance and incompetence. This morning Wildrose party leader Brian Jean has joined the Alberta boycott and is demanding the Enbridge ads be reinstated. “I’ll pick up my Tim’s coffee again when they decide to apologize for taking jabs at our industry, which is so important to Albertans,” Jean is quoted on CBC.ca. Of course Jean, like most Albertans, isn’t looking at the bigger picture. The question that Jean should really be asking, is the continuing unquestioning support for Enbridge actually harming the rest of the Alberta energy industry by increasing the resistance in northwestern BC to other energy projects? When are Alberta politicians, whether federal or provincial, ever actually going to show even a Timbit of respect for the issues in northwestern British Columbia? There is strong support (with some reservations) for the liquified natural gas projects. There is a level of support for pipelines that would carry refined hydrocarbons to the coast, something that the new premier of Alberta, Rachel Notley is seriously considering. But it is so typical of Alberta, the Alberta media and most of the Canadian media, to believe that the boycott was an attack on the entire energy industry. The fact is that Enbridge has been dealing with northwestern British Columbia for more than ten years and they still can’t do anything right. Shell, Chevron, Petronas (and before them Apache) and even TransCanada make more efforts to listen to the people, First Nations and non-Aboriginal residents alike, than Enbridge ever has or ever will (despite their claims in their PR campaigns). While these energy giants may not agree with what they hear, they are respectful and depending on their corporate culture are making genuine efforts to come up with ways to make their projects work. After a decade of blunders, however, Enbridge still hasn’t shown that much respect for anyone here. Those touchy feely ads that appear on television and at Tim Horton’s are just another example of how not to run a public relations campaign. There are those who oppose any bitumen sands extraction who signed the online petition, but the core of opposition, as always, comes from northwestern BC and the issue is an ill-conceived pipeline. Enbridge has been successful in one area of its public relations strategy. They’ve convinced Albertans that Enbridge and the Northern Gateway pipeline is an essential part of not only the Alberta economy but Alberta culture. Any attack on Enbridge becomes an attack on Alberta. Hence the unreasoned anger when after Tim Hortons pulled the ads. The other Big Lie we keep hearing from the Harper Government, is that this all orchestrated by American NGOs and activists. Again this shows Alberta-centric contempt for British Columbia. It’s very easy and convenient to keep believing that everyone in northern British Columbia are dumb and stupid and are being led by the ear by those nasty green Americans who have it in for the efforts to make Canada an energy superpower. That idea, promoted by the more conservative Canadian media has always been animal waste. The battle to protect the environment of northwestern British Columbia while at the same time attracting resource projects that have recognized and obtained social licence to operate has always and will always in BC on a case by case, community by community basis. 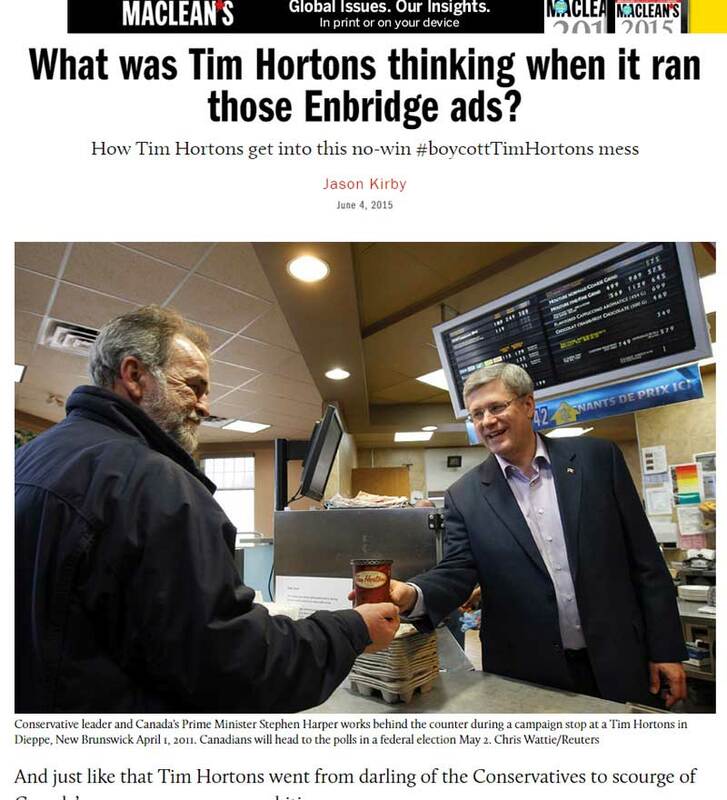 The only media that so far has managed to get it half right is Jason Kirby writing in MacLean’s who notes that the trouble began on May 18 when Enbridge put up the Tim Hortons ad on their own website. (Did I mention that Enbridge is both incompetent and arrogant?) 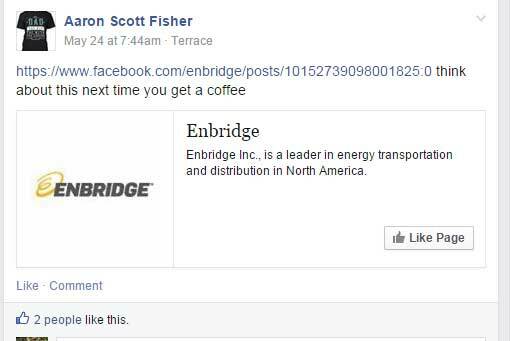 and it was immediately noticed by those individuals and activists that monitor the Enbridge website. 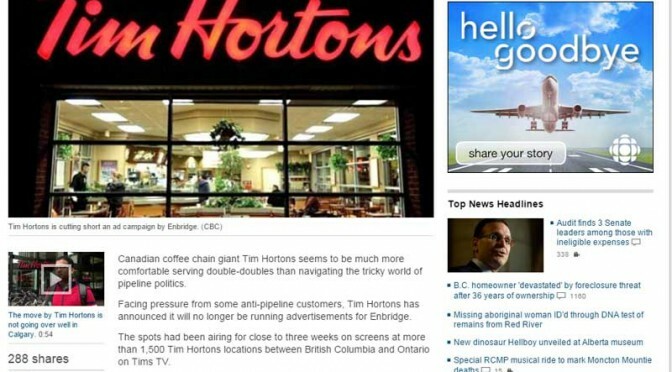 Social media across northwestern British Columbia, mostly Facebook, began spreading the news within hours of the ads appearing in the local Timmys. 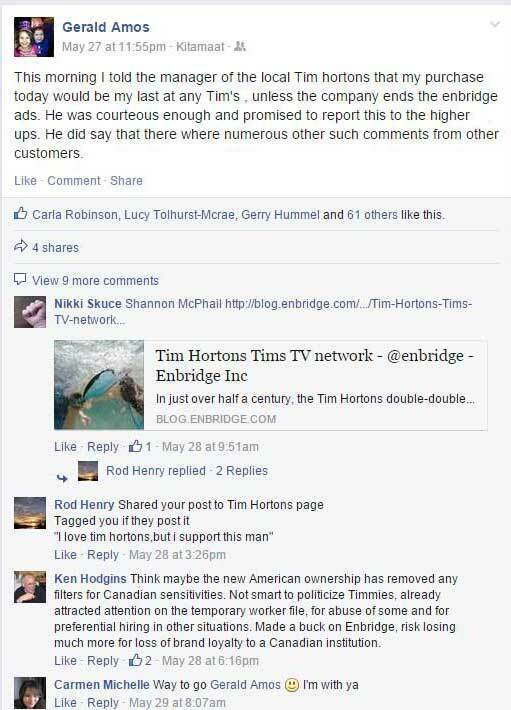 There were angry posts from individuals who had walked in Tim Hortons and saw the ads. Post in the Kitimat Politics Facebook group. Why didn’t the media get the story? So why wasn’t the story covered by the media at least ten days ago? 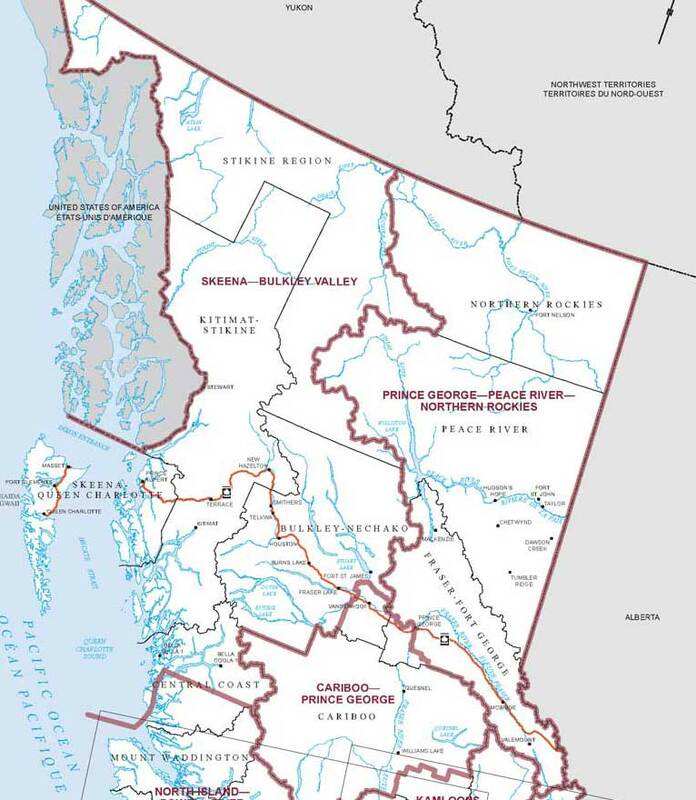 If you look at map of northern BC, and the two federal ridings Skeena Bulkley Valley and Prince George–Peace River–Northern Rockies, the population is about 200,000 spread over an area about half the size of Europe. Both ridings in this region are supposedly vital to the future of the Canadian economy, but you wouldn’t know it from most of the media. (The Globe and Mail is an exception, with more ongoing coverage of northern BC than you will find in either The Vancouver Sun or The Province). As for CBC, there are just eight radio staff, two in Prince Rupert and six in Prince George to cover all the apparently vital issues across half the province. ( Almost all the staff work mostly for the Daybreak North morning show which dominates the regional rates but it looks like with the latest CBC cutbacks that at least one of those positions will be eliminated). CBC TV and Global cover the region from Vancouver. At least the Vancouver based media make efforts to cover the north from time to time. The Alberta media, however, especially the Calgary Herald, is hopeless, and so biased against British Columbia and so dismissive of the issues here, that the coverage across Alberta is completely unreliable about 90 per cent of the time—it’s no wonder that the majority of Albertans have no understanding of British Columbia culture and issues. Then there are the punditi, pontificating from their cubicles in Ottawa and Toronto without a clue, without doing the basic journalism of picking up the phone (or writing an e-mail) to actually find out what’s going on. Andrew Coyne, for example, made these rather silly two tongue-in-cheek tweets Thursday night. While Coyne’s tweets do often exhibit a sense of humour, his excellent coverage of the decline of our democratic parliament has to be compared with his blind, unchecked ideological assumptions about the issues of the northwest, which are simplistic, cubicle bound and far off the mark. The same can be said for Jeffrey Simpson in his occasional writing about this region. Neither the view from the Hill, where you can see as far as the Queensway, nor from Bloor Street, where you can see part of the Don Valley, are vantage points to understand what is going in northern British Columbia. Update: Rex Murphy, writing in the National Post, has now joined the fray, no longer making a secret of his absolute disbelief in climate change and support for Enbridge. However, if you read his column, it is scathing in its contempt for the working men and women of British Columbia who want sustainable environmentally safe resource projects. It appears that to Murphy the only people in this country who actually work for a living in Canada are in Alberta and Newfoundland and no where else. Kitimat has been an industrial town since it was founded in the 1950s, Kitimat rejoiced when former Mayor Joanne Monaghan succeeded in bringing a Timmys to Kitimat and the majority of Kitimat residents voted in the plebiscite against Enbridge. But, of course, all those facts are irrelevant to Murphy and the other conservative pundits who never come within a thousand kilometres of northwestern BC, who believe we can’t think for ourselves and are easily misled by American environmentalists. No wonder journalism is in a death spiral. So let’s look at the specific errors in the media coverage of the Tim Horton’s story. Both Shawn McCarthy in the Globe and Mail and Kyle Bakyx on CBC.ca seem to accept without question that SumofUs, was the instigator of the petition. Like many issues in northwestern BC, the Lower Mainland or US based activist groups follow the lead of northwestern BC and jump on the bandwagon, not the other way around. Jason Kirby in MacLean’s says the boycott movement began a week ago. 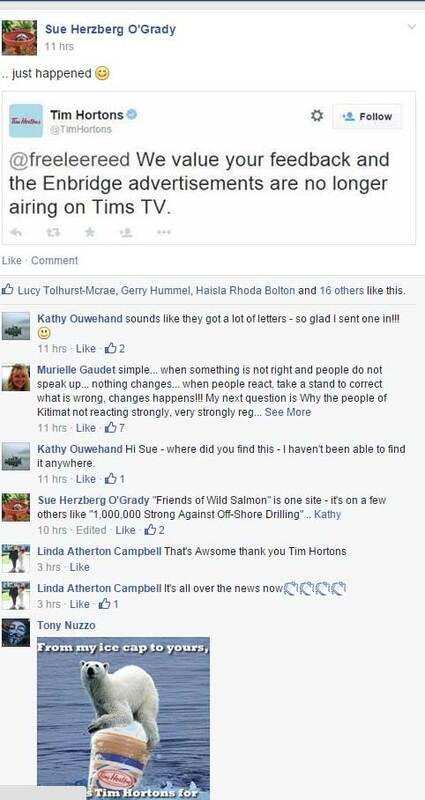 Here in Kitimat, it began within hours of the ads appearing in the local Timmys and was picked up on activist social media groups before the SumofUs petition site. When is the media ever going to learn that opposition to Enbridge is widespread across most of northern British Columbia, from First Nations to city and regional councils to a plurality of residents? When is the media going to drop the stock phrase “First Nations and environmentalists”? Does anyone remember the vote in Kitimat last April against the Northern Gateway project? The question that should have been asked whether or not Tim Hortons consulted their franchise owners in British Columbia before ordering them to play the ads. People here were “voicing their displeasure” from the moment the first Kitimatian walked into the local Timmys for an early morning coffee and had to stand in line while being told how wonderful Enbridge is. As for Jason Kenney, who is quoted by the CBC as tweeting: “I’m proud to represent thousands of constituents who work for Enbridge & other CDN energy companies,” if Kenney aspires to be Prime Minister one day, he had better start thinking about representing more Canadians than just those employed by the energy industry—a mistake that his boss Stephen Harper keeps making. Jason Kenney did visit Kitimat for a just a few hours in February 2014 for a tour of the Rio Tinto modernization project and an obligatory and brief meeting with the Haisla First Nation council. If Kenney had actually bothered to stick around a few more hours and talk to the community, everyone from the environmentalists to the industrial development advocates, he might not have been so quick on the trigger in the Twitter wars. Not one of the major media who covered this story, not The Globe and Mail, not CBC.ca, not MacLean’s, no one else, once bothered to actually call or e-mail someone who lives along the Northern Gateway pipeline route in British Columbia, the area where the boycott movement actually began to ask about Enbridge’s track record in this region. The media still doesn’t get it. This morning’s stories are all about Alberta. As usual, my dear, the media doesn’t give a damn about northwestern British Columbia. That is why the coverage of the Tim Hortons boycott is a double double failure of the Canadian media. Full disclosure. Since I took early retirement from CBC in 2010 and returned to Kitimat, I have worked as a freelancer for CBC radio and television, Global News, Canadian Press, The National Post, The Globe and Mail and other media. Now this isn’t just a freelancer who would like some more work (although it would be nice). If the media these days actually had environmental beats for reporters the boycott of Tim Hortons in northwest BC would have been flagged within a couple of days, not almost two and half weeks and later only when Alberta got hot under its oily collar. So as well as the Tim Horton’s boycott here are two major ongoing stories from Kitimat that the media haven’t been covering. Of course, in the bigger picture the media concentrates on business reporting. There haven’t been labour reporters for a generation. 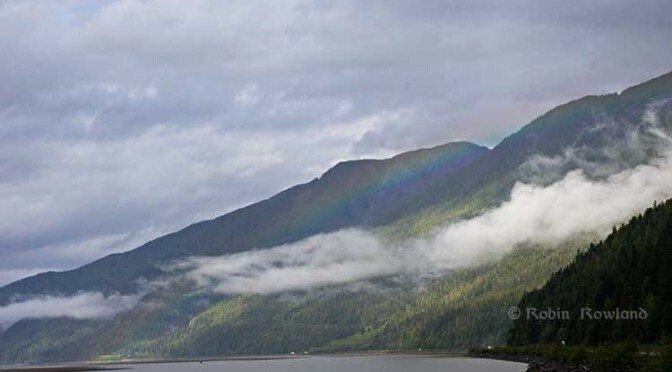 -The environmental hearings on the Rio Tinto Alcan proposal to increase sulphur dioxide emissions in the Kitimat Terrace air shed, after two weeks in Victoria, where there was no media coverage, are now continuing in Kitimat, where again there is little media coverage. CFTK is covering the hearings; otherwise the main coverage comes from the activist group DeSmog, hardly a credible or unbiased source. I made the decision not to cover the hearings either. I can’t afford any longer to sit around for two weeks, unpaid, no matter how vital the hearings are to the community. So if most Canadians were surprised that there was a boycott of the unofficial national symbol, Tim Hortons, it’s because of that double double media fail and as the media continues to decline, as budgets are cut, as “commodity news” disappears, expect more surprises in the future. Oh by the way Kitimat is vital to the national economy but we can cover it from a cubicle in Toronto. Final disclosure: I am not a coffee drinker. When I go to Timmy’s I prefer a large steeped tea and an apple fritter. 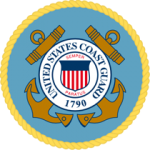 The United States Coast Guard says it is monitoring repairs aboard the liquid natural gas carrier Excel in Homer, Alaska, Friday, May 1. 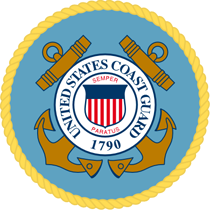 According to a news release from Coast Guard Sector Anchorage, USCG issued an order for the vessel to remain anchored in Kachemak Bay near Homer after the 908-foot, Belgium-flagged vessel experienced a loss of propulsion due to a failed engineering gasket while inbound to Cook Inlet Monday. The Excel was bound for the existing LNG facility, the Kenai LNG Plant, located in Nikiski on the Kenai Peninsula, in Alaska. The state of Alaska is planning to expand the LNG facilities there, and that site is a potential rival for British Columbia’s LNG export plans. The Excel was examined by Coast Guard inspectors from Marine Safety Detachment Homer, Tuesday, who conducted a Port State Control annual exam and verified the engineering gasket was replaced. While preparing to get underway Wednesday, the vessel experienced an automated engineering casualty and canceled its voyage until a Bureau Veritas (BV) classification surveyor could arrive and verify the engineering casualty was fully resolved. After arriving aboard the vessel, the class surveyor directed the vessel’s crew to test the automated engineering system and deduced that the casualty was a product of a faulty engine order telegraph; a device used on ships for the pilot on the bridge to order engineers in the engine room to power the vessel at a certain desired speed. Coast Guard Sector Anchorage issued another order for the vessel to remain in Kachemak Bay. Friday, the vessel was allowed to continue sailing to her destination at the ConocoPhilips LNG plant in Nikiski after additional safety measures were implemented. As part of the safety measures, the tug Stellar Wind escorted the vessel from Kachemack Bay to Nikiski and a second tug, the Glacier Wind, stood by in Nikiski to assist with docking operations. The Excel completed her voyage and safely moored at the ConocoPhilips pier in Nikiski at approximately noon Friday where it remains until permanent repairs are verified by the class surveyor and Coast Guard inspectors. The LNG export plant at Nikiski was built in 1969 by Phillips Petroleum and Marathon Oil. Phillips later merged with Conoco and subsequently purchased Marathon’s 30 per cent share. The Nikiski plant sent LNG shipments to Japan from 1969 to 2010 under long-term contracts with Tokyo Gas and Tokyo Electric, when the contracts expired. 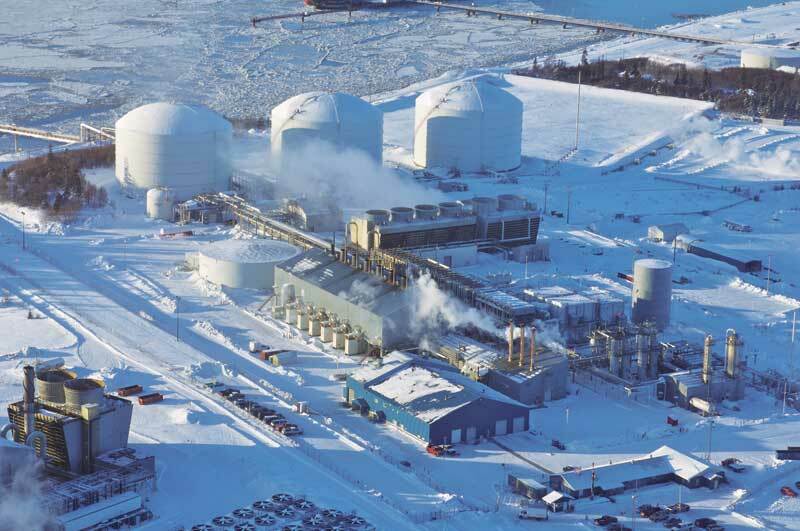 In 2011 ConocoPhillips announced that it would be ceasing LNG exports from Kenai and preserving the plant for potential future use. With the LNG rush, market conditions changed and the the plant resumed making LNG in early 2012 and exported four cargoes to Asian customers over the course of that year. In March 2013, the export licence expired and the LNG plant was put on standby. As interest in LNG grew, and at the urging of the state of Alaska, in December 2013 ConocoPhillips Alaska applied to resume LNG exports and the U.S. Department of Energy approved the resumption in April, 2014. ConocoPhillips says it received authorization to export a total of 40 BCF of liquefied natural gas over a two-year period from 2014 through 2016. The Alaska LNG project is “a proposed $45 to $65 billion liquefied natural gas export project – it would be the largest single investment in Alaska history. The project has the potential to create between 9,000 and 15,000 jobs during the design and construction phases; plus approximately 1,000 jobs for continued operations. In addition to generating billions of dollars in revenue for Alaska, the project will provide access to natural gas for Alaskans.” The project’s participants are the Alaska Gasline Development Corporation (AGDC) and affiliates of TransCanada, BP, ConocoPhillips, and ExxonMobil. Sending the Northern Gateway Pipeline to Prince Rupert: A dumb, dumb, dumb idea—and here are the photos to prove it. There’s a dumb, dumb, really dumb idea that just won’t go away—that Enbridge could solve all its problems if only, if only, it would send the Northern Gateway Pipeline to Prince Rupert. Enbridge long ago rejected the idea. Before Enbridge updated its website to make Gateway Facts, to make it slick and more attractive, the old website had an FAQ where Enbridge explained why it wasn’t going to Prince Rupert. Did you consider running the pipeline to Prince Rupert where a major port already exists? We considered Prince Rupert and Kitimat as possible locations. We carried out a feasibility study that took into account a number of considerations. 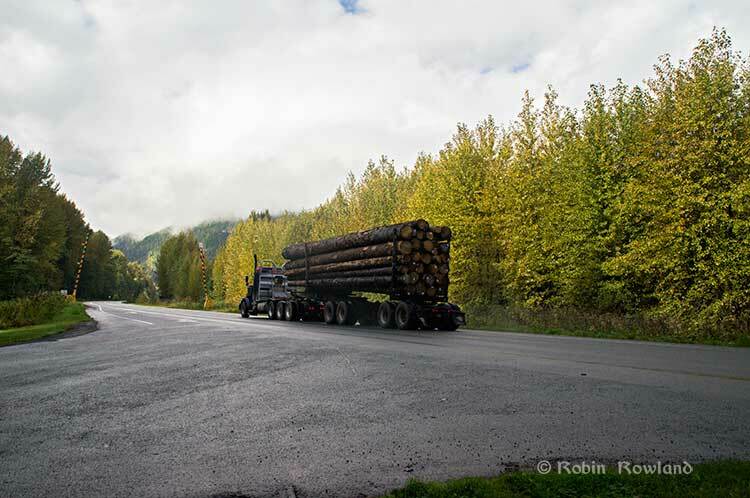 The study found that the routes to Prince Rupert were too steep to safely run the pipeline, and that Kitimat was the best and safest option available. Here in the northwest even the supporters of the Northern Gateway roll their eyes when they hear the old Prince Rupert story come up again and again – and it’s not just because these people support the Kitimat plans for Northern Gateway, it’s because those supporters (not to mention the opponents) have driven along the Skeena from Terrace to Prince Rupert. There just isn’t any room for a pipeline. It’s a game of centimetres. Now the new premier of Alberta, Jim Prentice, who should know better if he’s going to lead that province, is hinting that Kitimat isn’t the only possible solution for the Northern Gateway. Without specifying Prince Rupert, according to Gary Mason reporting in The Globe and Mail, Prentice was speculating about an alternative to Kitimat. Asked whether he believes the Gateway terminus should be relocated to Prince Rupert or another destination, Mr. Prentice said, “Everything I’ve heard from the Haisla who live there is they don’t agree with the terminal being in Kitimat.” Is it possible to get First Nations approval if there is no support at the planned terminus site? “It’s pretty tough,” the Premier said. Prince Rupert has a thriving local fishing industry that employs hundreds of people and is critically important to the local First Nations. He is convinced the community would not be willing to put that at risk. “Overwhelmingly people in my community are much more comfortable with liquefied natural gas, with wood pellets, with coal, than any oil product,” he said. A spokesman for the Prince Rupert Port Authority said Wednesday there is currently no room for Enbridge to build at the port even if it wanted to. “We are fully subscribed,” Michael Gurney said. There are two large vacant lots within the port authority’s jurisdiction, but both are locked by other energy companies, earmarked for LNG projects. So not only is there no room on the road to Prince Rupert, there is no room in Prince Rupert. Let’s just consider for a moment that if Prince Rupert was the ideal location for the Northern Gateway terminal (which it is not), what would be needed to get the project going today. The Northern Gateway Joint Review Panel would have be reconstituted or a new JRP created by the National Energy Board. That’s because the bitumen comes from Bruderheim, Alberta, crossing provincial boundaries and thus it’s in federal jurisdiction. Even under the fast track rules imposed on the NEB by Stephen Harper’s Conservative government, new environmental and social impact studies would be required, starting from scratch. So add another five years of paperwork before a single shovel goes into the ground. The pipeline would have to cross the traditional territory of First Nations that, so far, have not been part of the negotiations, mostly the Tsimshian First Nation as well as the Nisga’a First Nation which has a treaty establishing local rule over their territory. 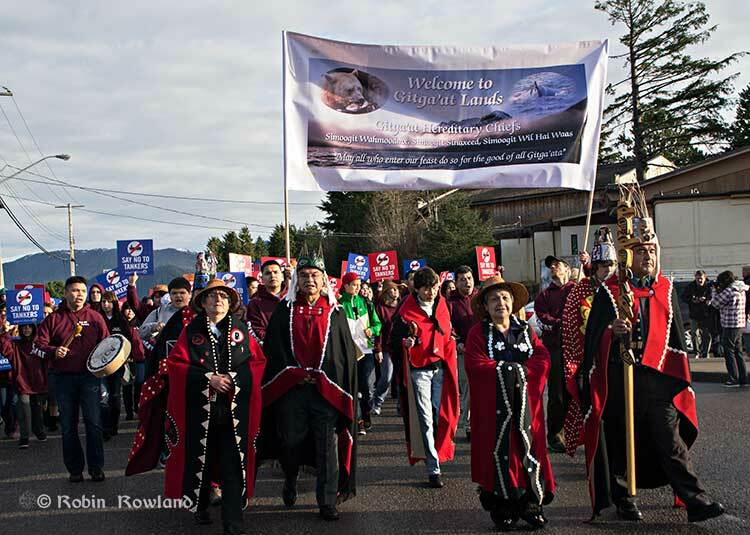 In February 2012, the largest anti-Enbridge demonstration outside of the Lower Mainland took place in Prince Rupert, with the elders of the Tsimshian First Nation welcoming the elders and members of the Gitga’at First Nation, at Hartley Bay, which had organized the protest. While Kitimat Council long stood neutral on the issue, the councils at Prince Rupert, Terrace, Smithers as well as the Kitimat Stikine Regional District and the Skeena Queen Charlotte Regional District had voted to oppose the Northern Gateway. The Skeena is one of the greatest salmon rivers on the planet. The Petronas LNG project has already run into problems because its planned terminal at Lelu Island would also impact the crucial eel-grass which is the nursery for young salmon leaving the Skeena and preparing to enter the ocean. Note that northern BC is generally in favour of LNG terminals, if the terminals are in the right place, so expect huge protests against any bitumen terminal at the mouth of the Skeena. When I say there isn’t room for a pipeline along the Skeena, it also means that there isn’t any room for the pipeline corridor right-of-way. Enbridge, in its submissions to the Joint Review Panel, said it requires a 25 metre wide right of way for the pipeline corridor. (For the record that’s just over 82 feet). Along that highway, as you will see, there’s barely enough room for the CN mainline and Highway 16 (also known as the Yellowhead Highway) and on a lot of places both the highway and the railway roadbed are built on fill along the side of a cliff. Albertans’ desperate desire to see the Northern Gateway go to anywhere to what they call “tide water” keeps coming up like the proverbial bad penny. The latest came when Jim Prentice speculated about a new route for the Northern Gateway. I knew I had an appointment coming up in Prince Rupert on Monday, September 29. So I decided that only way to prove to people sitting in Calgary, Edmonton and Fort McMurray playing with Google Maps that the pipeline to Prince Rupert was a really dumb idea was to shoot photographs to show just why the Northern Gateway will never go to Prince Rupert—at least along the Skeena. As you drive out of Terrace, you pass two large swing gates (also called by some “Checkpoint Charlie” gates after the Cold War era crossing in Berlin.) At the first rest stop west of Terrace, there are another set of gates at the Exstew. There’s a third set of gates just outside Prince Rupert. 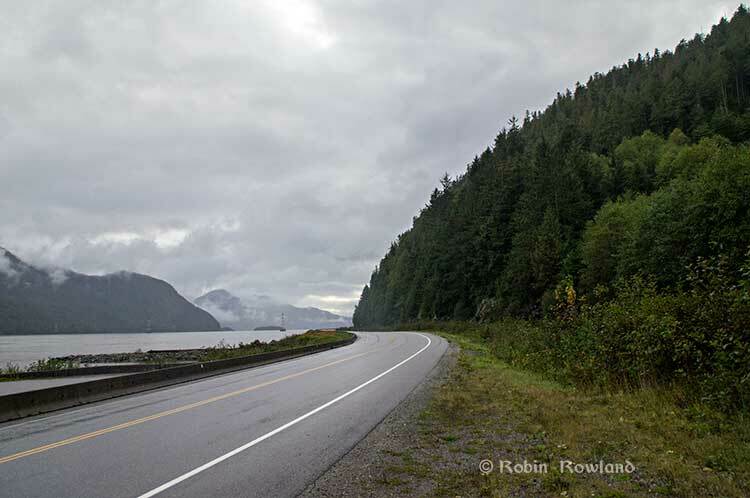 The drive along the Skeena from just west of Exchamsiks River Provincial Park all the way to Tyee where the highway turns inland to reach northwest to Prince Rupert on Kaien Island is one of the most spectacular drives on this planet. The highway snakes along a narrow strip of land with steep mountain cliffs on one side and the vast river on the other. The problem is that apart from locals and tourists, none of the “experts” whether journalist, think tanker, bureaucrat or politician have, apparently ever driven from Prince Rupert to Terrace. When both Opposition Leader Tom Mulcair and Liberal Leader Justin Trudeau were in the northwest earlier this summer to “engage” with the local people, apart from short boat trips down Douglas Channel, they flew everywhere. Scheduling you know. Stephen Harper has never visited northwest BC and probably never intends to. His cabinet members fly in for photo ops and then are on the next plane out of town. Of all the visiting journalists who have come to the northwest only a couple have bothered to drive around the region. Most fly-in fly-out. These days, most often budget-strapped reporters never leave their offices, interviewing the same usual suspects by phone on every story. On Monday, I took most of the photographs on my way back from Prince Rupert to Terrace after my appointment, so the sequence is from west to east. There are also very few places along the river where you can safely stop. There are concrete barricades on both sides of the highway to prevent vehicles either going into the river or onto the narrow CN right-of-way. 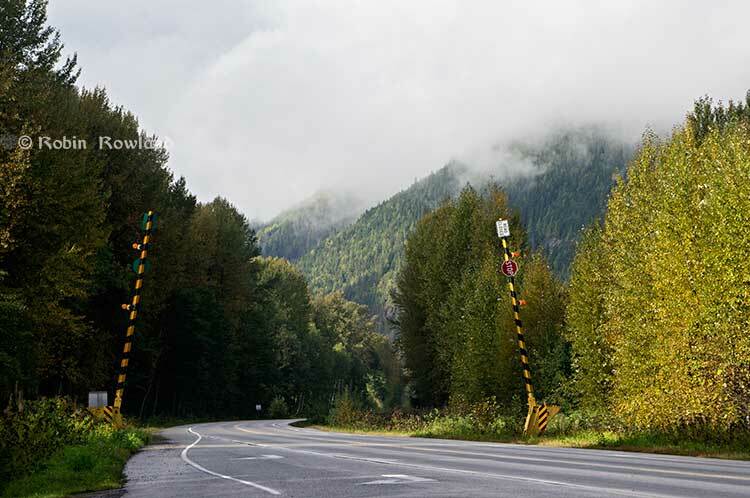 There are, however, two rest stops and a number of small turnoffs on the highway, the turnoffs mainly intended for use by BC Highways, but which are also used by tourists, fishers and photographers. The first image was taken at one of those highway turnoffs just east of Aberdeen Creek. This is what the highway and rail corridor are like all along the Skeena, the highway, bounded by concrete barricades, the CN rail line and then the towering mountains. Note where the telegraph and telephone lines are—further up the cliffside. A closer view of the highway and rail corridor just east of Aberdeen Creek. Here is the view of the Skeena River from the Aberdeen Creek turnoff. You can see to the east, a mountain and the narrow strip of fill land that supports the highway and the rail line. 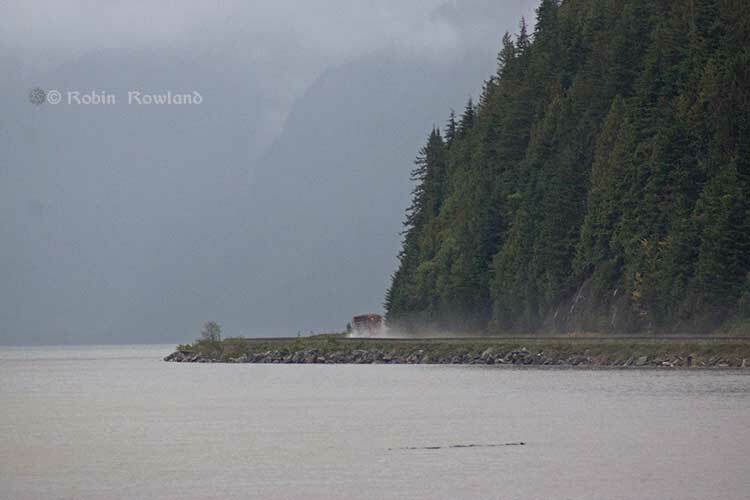 You see the broad width of the mighty Skeena, the Misty River, as it is called by the Tsimshian First Nation and by everyone else who lives in the northwest and on the right side of the image, the highway and rail corridor built on fill. Any room for a pipeline? There’s another turnoff on the other side of the headland east of Aberdeen Creek, looking back the way we came. The final small turnoff is just by the Kylex River. Again you can see how narrow the highway and rail corridor are. A few kilometres further along—as I said the highway snakes and curves its way along the riverbank– you come to the Basalt Creek rest area. So this telephoto image shows a logging truck heading west, taken from Basalt Creek, looking back at the highway. Again you can see both the highway and CN line are built on fill. Is there any room for a pipeline? Any room for a 25 metre pipeline right-of-way? 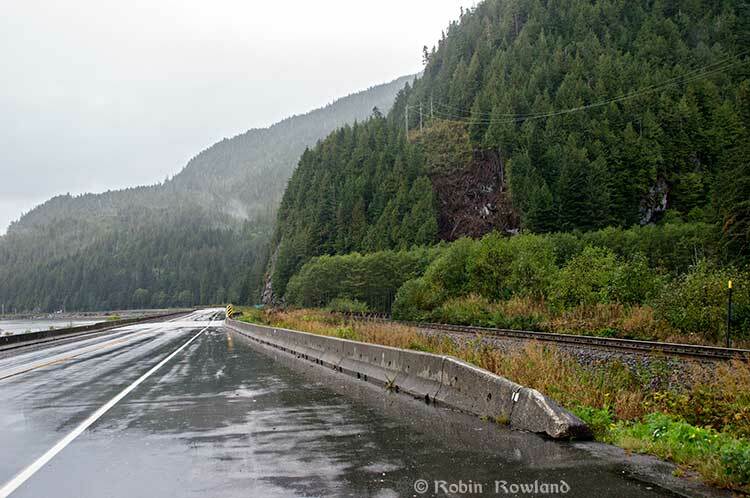 Between Basalt Creek and Telegraph Point, a few kilometres to the east, again the highway and rail line hug the narrow strip between the river and mountains. 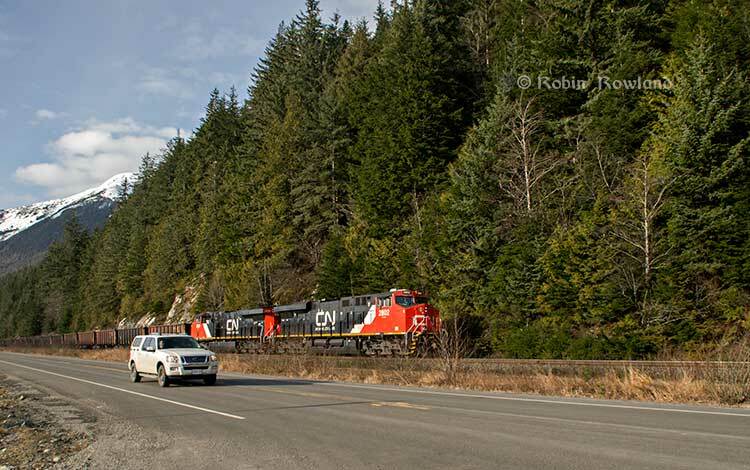 This shot, taken from Telegraph Point, in October 2013, shows a CN intermodal container train heading to Prince Rupert. The container trains and the coal trains usually have between 150 and 180 cars. If a winter avalanche took out a train, there would be environmental damage, but that damage would be insignificant from coal or containers compared to a train of railbit tankers carrying diluted bitumen. 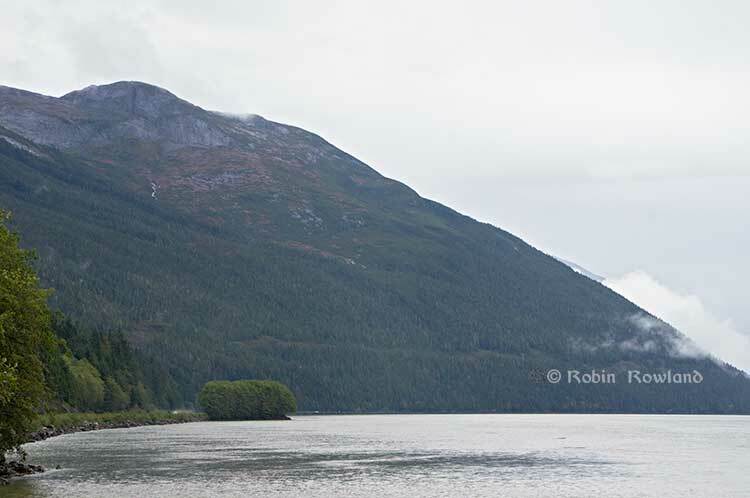 At Telegraph Point, the second of the three rest stops between Prince Rupert and Terrace, again there is just a narrow strip between the mountain, the highway and the river. Across the highway from the rest stop, you can again see the narrow corridor, the first shot looking west the rail line close to the cliff face, the second, east, with the waterfall, which you don’t see during the rest of the year, fed by the fall monsoon. Everyone has assumed that if Northern Gateway changed its route, the most likely choice given the configuration of the pipeline at the moment is to follow the Skeena. The BG Group and Spectra Energy are also contemplating a pipeline…although details on the website are rather sparse. If Enbridge wanted to try a northern route, similar to the one TransCanada contemplates for Petronas, Northern Gateway would again run into trouble. It would require reopening or creating a new Joint Review Panel, many more years of environmental and social impact studies of the route, even under Stephen Harper’s fast track system. The TransCanada/Petronas pipeline would also cross the traditional territory of the Gitxsan First Nation and if Enbridge tried that the company would have to deal with the fact that it signed a controversial agreement with Elmer Derrick that was immediately repudiated by most members of the Gitxsan First Nation and eventually dropped by Enbridge. So why does this idea of a pipeline to Prince Rupert keep coming up? Perhaps the worst example of this failure of both analysis and journalism came in the Edmonton Journal on July 7,2014, when it published a piece by Bob Russell, entitled Opinion: Make Prince Rupert the terminus, which went over the same old inaccurate arguments. The overland route currently proposed by Enbridge is fraught with environmental issues because it goes over coastal mountains and streams before entering Kitimat’s port. This port will also be the base of perhaps as many as four liquefied natural gas terminals, which will result in the channel always busy with LNG ships outbound and returning from many Asian ports. There are existing rights of way for the major highway, the Yellowhead, and CN Rail line from Edmonton to the Port of Prince Rupert, so this eliminates the issue of transgressing First Nations lands. The technical issues of narrow passages can be overcome with engineering. In fact, the pipeline can be buried in the roadway at some restricted locations if absolutely necessary, but two different engineers have assured me that for the most part, the right of way should be able to handle the pipeline. A vital factor, of course, is to reduce the impact by eliminating the need for two pipelines. Bob Russell has an extensive background in planning and was a member of the Edmonton Metro Regional Planning Commission. He has flown the Douglas Channel, visited Kitimat and toured the Port of Prince Rupert. This is so typical of the Albertan attitude toward northwest British Columbia, people fly in for a couple of days, make a quick observation, and fly out again and present themselves as experts on the region. (Some “experts” on Kitimat, very active on Twitter have apparently never left Calgary). It obvious that the “two engineers” who assured him “the right-of-way could handle of pipeline” have no idea what they’re talking about. As the photos show there is barely enough room for a highway and a rail line much less a 25 metre wide pipeline corridor. If the pipeline was to be built as Russell proposed, the only highway between Prince Rupert and the rest of Canada would have to be closed for years, there are no detours. All so a pipeline can be buried under the asphalt not in solid ground, but in the fill on the side of a riverbank in an avalanche zone? Of course, closing a highway up here won’t inconvenience anyone in Edmonton or Calgary, will it? There are existing rights of way for the major highway, the Yellowhead, and CN Rail line from Edmonton to the Port of Prince Rupert, so this eliminates the issue of transgressing First Nations lands. I was told by First Nations leaders during the Idle No More demonstrations in the winter of 2013, that, a century ago, when the Grand Trunk built the railway along the Skeena , they did just that, built it without consulting the First Nations along the route, sometime digging up native cemeteries and sacred spots. While apparently CN has worked in recent years to improve relations with the First Nations along the rail line, according to those leaders some issues of right-of-way remain to be resolved. If there were any plans to build a diluted bitumen pipeline along that route, that would likely mean another court battle adding to those already before the Federal Court, a court battle that would cost Enbridge, CN, the federal government, environmental NGOs and the First Nations more millions in lawyers’ fees. It’s doubtful if in the long gone (and perhaps mythical) days of “get it right” journalism that the Russell opinion piece would have passed the scrutiny of an old fashioned copy editor and fact checker. In 2012, the Edmonton Journal (in a story no longer available on their website) also cited former Alberta Premier Peter Lougheed and former Bank of Canada governor David Dodge, as also favouring Prince Rupert. Dodge, who was in Edmonton Tuesday to deliver a speech on the global economic outlook at MacEwan University, said Enbridge’s proposed Northern Gateway pipeline to Kitimat looks like even more of a long shot. Dodge’s views echo those of former Alberta Premier Peter Lougheed, who also favours looking at an alternate pipeline route to Prince Rupert, where ocean-going supertankers can navigate more easily. 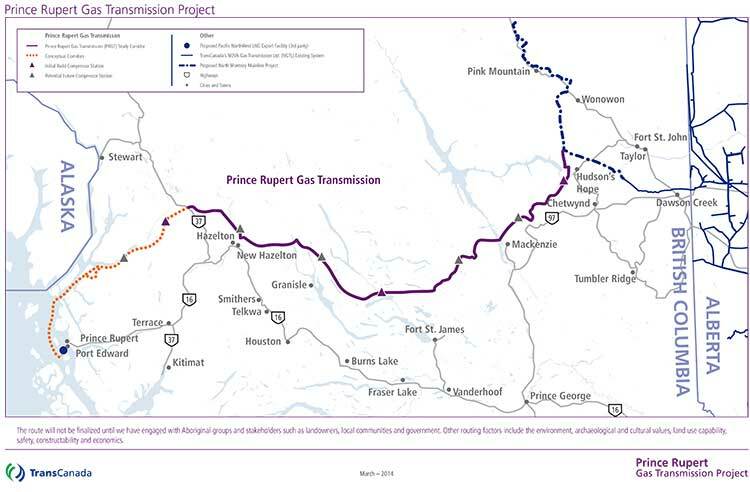 So why do people insist, despite the evidence, that the Northern Gateway go to Prince Rupert? It’s no longer an pipeline; it’s emotion and ideology. Ideology in that opposition to the Northern Gateway is seen by conservatives as heretical opposition to free enterprise itself. Emotion among those who see promoting the oil patch as an issue of “Alberta pride” and even Canadian patriotism. For the promoters of the pipeline to Prince Rupert, ignoring the science of geology and the study of geography across all of northwestern B.C. is no different than repeatedly knocking your head against the Paleozoic metamorphic greenstone of the mountain cliffs along the Skeena. It only gives you a headache. Things haven’t gotten much better in the past two years. In fact they’re getting worse as opposition to pipelines mounts. It seems that in 2014 the Alberta and the federal government policy in promoting pipelines Northern Gateway, KinderMorgan’s TransMountain, Keystone XL, Line 9 Reversal and Energy East (slick PR and smiling representatives at open houses, politicians at strictly controlled photo ops) is to ignore facts on the ground and to refuse to deal with the concerns of local people from coast to coast. There could, perhaps, be a more inclusive and truly science-based pipeline planning process that could see pipelines go on optimum routes but that isn’t happening. The Save Our Salmon website has a different view, arguing that federal government and the energy companies have a plan to create an energy corridor for bitumen pipelines to Prince Rupert. The Coastal Gaslink pipeline proposal to bring natural gas to Kitimat for the Shell LNG Canada project is now entering the 45 day public comment environmental assessment period. It opens on March 21, 2014 and closes May 5, 2014. Coastal GasLink Pipeline is a wholly-owned subsidiary of TransCanada Pipelines. The company is proposing to develop an approximately 650 kilometre pipeline to deliver natural gas from the area near the community of Groundbirch, B.C., to the LNG Canada gas liquefaction facility proposed to be developed by Shell Canada Ltd. and its partners in Kitimat. An electronic copy of the Application and information regarding the British Columbia environmental assessment process are available at www.eao.gov.bc.ca. The British Columbia Environmental Assessment Office, with the support of Coastal GasLink, will host four open houses in northern B.C. communities during the comment period. The proposed Project would have an initial capacity of about two to three billion cubic feet (bcf) of natural gas per day with the potential for expansion up to about five billion cubic feet per day. The company says the expansion scenario assessed in the application does not involve the construction of additional pipeline; the number of potential future compressor stations would change. The proposed pipeline is subject to review under British Columbia’s Environmental Assessment Act. Starting on March 21, there are 45 days for the submission of comments by the public in relation to the Application. All comments received during this comment period will be considered. The intention of seeking public comments is to ensure that all potential adverse effects – environmental, economic, social, heritage and health – that might result from the proposed Project are identified for consideration as part of the assessment process. Copies of the application are available in digital or paper form at public libraries in the project area. In the online survey of a representative sample of British Columbians, support for the proposed Northern Gateway Pipelines stands at 42%, a seven-point increase since an Insights West poll conducted in February. Conversely, opposition to the project has dropped by 14 points, from 61% at the start of 2013 to 47% today. It is important to note that the level of “strong opposition” to the project has fallen to 29% (down 9 points since February), while “strong support” increased to 16% (+5). What the press release doesn’t tell you is that opposition to the Northern Gateway, according to the poll, is at 65 per cent in Northern British Columbia, with 50 per cent strongly opposed and 15 per cent somewhat opposed. We have assumed that the same margins of error apply as if it were a true unweighted random probability sample with a margin of error of +/- 3.7 percentage points, nineteen times out of twenty. The problem with the Insight West poll, like all other polls on the Northern Gateway, is that it is weighted toward the population heavy Lower Mainland. The tables released by Insight West show that the online poll had 504 respondents in Vancouver and 25 in Northern BC. Northwest Coast Energy has spoken to pollsters both on the record and on background and it is clear that the polling entire province distorts the issue along the pipeline route. First is the standard polling definition of Northern British Columbia, which is based on Census data. “Northern BC” actually begins at Williams Lake, although most people believe Northern BC begins around Prince George. Second the polls, due to small population and sample size, do not usually divide northwestern British Columbia, where the opposition is strongest to the Northern Gateway project, and northeastern British Columbia, where the energy industry is a major employer and support for the project is likely stronger. Braid says the 168 people represents 17% of the sample. These interviews would have been weighted down to about 7% in the overall results to reflect the actual population of the North in BC. The margin of error in the North is about +/-7.6%, 19 times out of 20. So with a total sample of 749 in the Insight West online poll and just 25 people in Northern BC surveyed, that means the Insight West poll survey of Northern BC covers just 3.3 per cent of the total sample. In contrast, 504 people in Vancouver were surveyed, accounting for 67.2 per cent of the sample. British Columbians continue to be of two minds on the Northern Gateway,” continues Canseco. “There is a large proportion of the population that remains concerned with the possibility of oil spills and environmental problems, but the argument about economic benefits has gained traction over the past few months. The actual tables show that of the 25 people surveyed in Northern BC, 50 per cent “strongly oppose,” (13 out of the 25 people surveyed) 15 per cent “somewhat oppose” Northern Gateway. Twelve per cent “somewhat support” the project, four per cent (one person) “strongly support” the project. Those numbers, although small, are likely an accurate reflection of the sentiments in northern BC, although a breakdown between the western and eastern parts of Northern BC would have been helpful. As for the residents of Vancouver, the poll shows that area is divided (as the Insight West news release says) with 22 per cent strongly supporting (119 people) and 27 per cent somewhat supporting the project and 19 per cent somewhat opposed and 27 per cent strongly opposed (123 people). You can see the poll tables here. The “growing support” for the pipeline project that Enbridge is promoting from the poll likely shows that their advertising campaign is having some impact on the Lower Mainland but is ineffective in the north. It is possible to do more accurate polling on energy issues in Northern British Columbia. Earlier this year, a significant number of Kitimat residents reported that they had received calls from a polling company representing TransCanada which will be building the Coastal GasLink pipeline project for LNG Canada, a project where Shell will operate the terminal in Kitimat. On Monday, when TransCanada officials appeared before District of Kitimat council, they did acknowledge that they have been polling people along the pipeline route so they can understand their concerns. So far, TransCanada has not released the results of that poll. 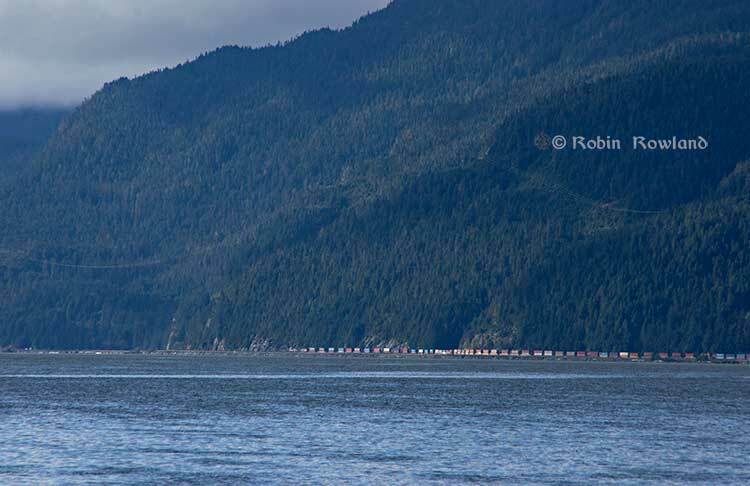 The future of tankers sailing along the British Columbia coast, and the export of crude through BC could change drastically by the end of 2014. By some time in 2014, the planned expansion of the Panama Canal will be complete, allowing more large ships, including tankers, to pass through the Canal and ply up and down the west coast. It is also possible that British Columbia coastal ports could not only be used for export of bitumen from the Alberta oil sands and liquified natural gas from northeast BC, but also for oil shale crude found in the Bakken Shale formation in North Dakota and Montana, possibly later shale oil from Saskatchewan and Manitoba. Those startling conclusions are found in the full draft supplementary Environmental Impact Statement (EIS) on the Keystone XL pipeline project issued last week by the United States States Department. (Most media reports concentrated on the EIS executive summary, the details on British Columbia are contained in the actual report). The Keystone EIS surprisingly contains a number of scenarios in British Columbia, even though BC is thousands of kilometres from the proposed TransCanada pipeline from the bitumen sands to the refineries on the US Gulf Coast. The State Department report had to give President Barack Obama all possible options and that it why the EIS report included what it calls “no action alternatives” –what would happen to the bitumen and oil if Obama rejects the Keystone pipeline. Assuming that the oil, whether bitumen or Bakken oil shale has to get to the Gulf refineries by other means, the EIS takes a close look at one case, via CN rail to Prince Rupert, from Prince Rupert by tanker down to the expanded Panama Canal, then through the Panama Canal to the oil ports of Texas and Louisiana. Another possibility, although less detailed in the EIS, also considers scenarios where bitumen from the Alberta oilsands or shale crude from the Bakken formation was shipped to Vancouver via the Kinder Morgan pipeline system, to Kitimat via the proposed Northern Gateway pipeline. The State Department rejected the Kinder Morgan and Northern Gateway options for detailed analysis because of the controversy over both projects. The Keystone EIS was released by the State Department on Friday, March 1, 2013, and is seen as generally favouring TransCanada’s Keystone XL pipeline project. Despite the EIS report conclusions that the Keystone project would have little adverse impact, the final decision by President Obama will be largely political. In developing alternative transport scenarios, efforts were made to focus on scenarios that would be practical (e.g., economically competitive), take advantage of existing infrastructure to the extent possible, used proven technologies, and are similar to transport options currently being utilized. Use of approximately 1,100 miles (1,770 kilometres) of existing rail lines from the proposed Lloydminster rail terminal complex to a new approximately 3,500-acre (1,400 hectare) rail terminal complex where the oil would be offloaded from the rail cars, with a short pipeline connection to the port at Prince Rupert. 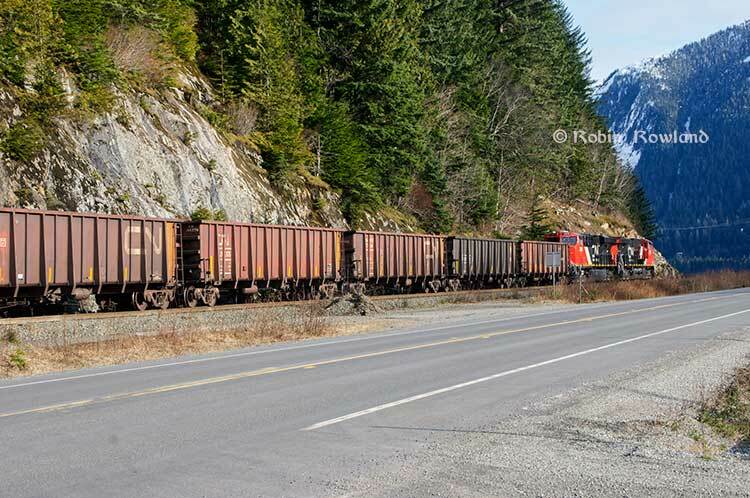 That, of course, would be in addition to the already heavy rail traffic to Prince Rupert with grain and coal trains outbound and container trains inbound, as well as the VIA Skeena passenger train. The railway to Prince Rupert is evaluated using the same criterion under US law that was used to evaluate the Keystone project, including affects on surface water, wetlands, the coast, wildlife, threatened and endangered species, fisheries, landuse, construction, green house gases and even sea level rise. The overall EIS view of the impact of a Prince Rupert project would likely bring protests from those who already oppose the Northern Gateway pipeline project. refineries would not have any effects on geology, soils, groundwater, wetlands, vegetation, land use, socioeconomics, noise, or cultural resources, other than in the event of a spill. one to two additional Suezmax tanker vessels per day (430 tankers per year) would travel between Prince Rupert and the Gulf Coast area refinery ports via the Panama Canal. That, of course, could be in addition to any tankers from the Northern Gateway project, if it is approved, as well as tankers from the liquified natural gas projects at both Kitimat and Prince Rupert. The concept of the Suezmax tankers is critical to the west coast, even if none of the scenarios eventually happen. The State Department report notes that the Panama Canal is now being expanded, and that beginning sometime in 2014, larger ships, including tankers, can go through the canal. The current size is Panamax (maximum size for the current Panama Canal) to Suezmax (the maximum size for the Suez Canal). (The Panama Canal expansion program began in 2006 and is scheduled for completion in 2014. According to the State Department that means even if the even bigger Very Large Crude Carriers are not calling at west coast ports to take petroleum products to Asia, the Suezmax tankers might likely be calling in Vancouver at the terminal for the existing (and possibly expanded) Kinder Morgan pipeline. Both Kinder Morgan and Port Metro Vancouver have said that the ships that call at the Kinder Morgan Westridge Terminal are Aframax tankers, and even they are not loaded to capacity, because of the relatively short draft in the Burnaby area of Vancouver harbour. Both Kinder Morgan and Port Metro Vancouver say that there are no current plans for larger tankers to call at Westridge. So one question would be is the State Department report pure speculation or is there, perhaps, somewhere in the energy industry, a hope that one of Vancouver’s deeper draft ports could be the terminal for a pipeline? The Keystone EIS for the first time outlines the railway to Rupert senario, which has long been touted by some supporters as an alternative to the Northern Gateway project, but without the detailed analysis provided for Northern Gateway by both Enbridge and those opposed to the project. Although based largely on published documents and in some ways somewhat superficial (the State Department can’t find any cultural resources in Prince Rupert), the EIS largely parallels the concerns that are being debated by in Prince Rupert this month by the Northern Gateway Joint Review Panel. What the Keystone Report says about the Kinder Morgan pipeline to Vancouver. What the Keystone Report says about CN rail carrying crude and bitumen to Prince Rupert. 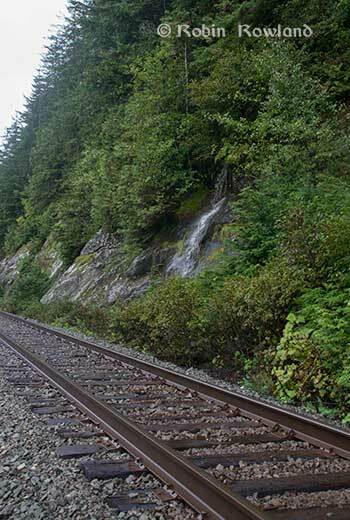 The State Department Environmental Impact Study of the railway to Prince Rupert scenario. The United States Department draft Environmental Impact Statement (EIS) not only had to evaluate the main subject, the controversial Keystone XL pipeline project, but possible alternatives as well. So that’s why the EIS took a couple of looks at Kitimat, with two possibilities for replacing the Keystone XL with a Kitimat terminal. • The proposed Nothern Gateway Pipeline project. The study doesn’t just include various forms of diluted bitumen from the Alberta bitumen sands, but petroleum products from the Western Canadian Sedimentary Basin (WCSB) and crude oil from the Bakken shale shipped to the refineries on the US Gulf Coast which would be served by the Keystone XL pipeline if it was not approved. The EIS examined the Northern Gateway project and rejected the Enbridge pipeline as a possibility for Alberta bitumen and crude because of the continuing controversy. However, a reading of the report shows that there could be pressure in the future for a bitumen or crude export terminal at Kitimat that would be served by the existing CN rail line (even though the State Department report prefers Prince Rupert as the best choice as an alternative to Keystone). First Nation bands and other organizations. Opposition to the project remains strong as evidenced by media reports of the January 2013 public hearings in Vancouver on the permit application. It remains uncertain at this time if the project would receive permits and be constructed, and therefore the option of moving additional crude to Kitimat was eliminated from detailed analysis. However the State Department report does seriously consider transportation of WCSB crude by rail to Vancouver, Kitimat and Prince Rupert. 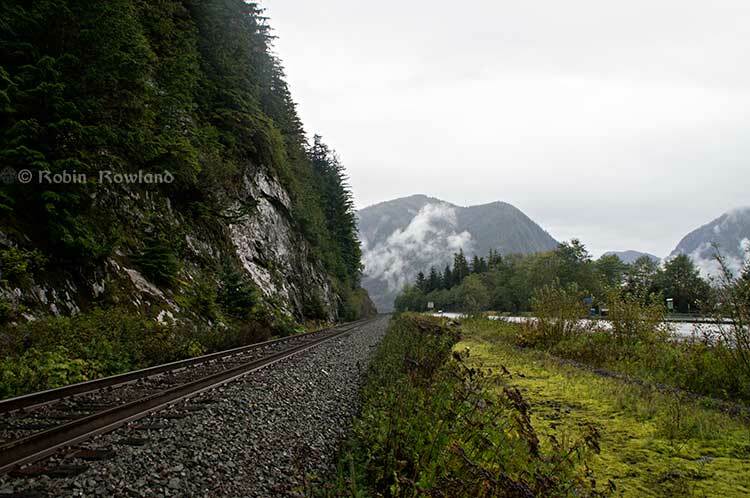 The report takes an in-depth look at the railway to Prince Rupert option. One reason is that even if it is transported by rail, the market in Asia is still more attractive to the energy industry than using Kitimat or Prince Rupert as a possible terminal for export to the US Gulf. would be significantly cheaper than trying to export it via the U.S. Gulf Coast. The total per barrel cost of export to Asia via pipeline to the Canadian West Coast and onward on a tanker is less than just the estimated pipeline tariff to the U.S. Gulf Coast for the proposed Project, and is less than half the cost of the Gulf Coast route to Asia. If pipelines to the Canadian West coast are not expanded or approved, even incurring the additional cost of rail transport to the West Coast ports (Vancouver, Kitimat, or Prince Rupert), estimated at $6 per barrel, results in a total transport cost to Asia that is still 40 percent cheaper than going via the Gulf Coast Absent a complete block on crude oil exports from the Canadian West Coast, there would be little economic incentive to use the proposed project as a pass through. The high costs of onward transport to other potential destinations tend to mitigate against WCSB heavy/oil sands crudes being exported in volume from the Gulf Coast. The EnSys 2011 study found that the rail systems of the United States and Canada were not at that time running at capacity, that there is significant scope to expand capacity on existing tracks through such measures as advanced signaling, and that adequate cross-border Canada/U.S. capacity exists to accommodate growth in rail traffic that would be associated with movements at the level of 100,000 bpd cross-border increase per year or appreciably higher. In addition, rail lines exist to ports on the British Columbia coasts (notably Prince Rupert, Kitimat, and Vancouver), which could be used for export of Western Canadian crudes. economic incentive to utilize any West Coast export options, if they are available. ones that would reduce reliance on the United States as, essentially, the sole market option. In other words, even if Northern Gateway is stopped, there could be considerable pressure to export bitumen and crude oil from Alberta not only through Prince Rupert, the site preferred by the State Department EIS, but though Kitimat as well. That might just open the door for David Black’s proposed $16 billion refinery at Onion Flats near Kitimat. As noted elsewhere on the site Black has possible investors for construction of a new oil refinery approximately 25 kilometers to the north of Kitimat BC on a 3,000 hectare site. Black’s Kitimat Clean website says the refinery would process 550,000 barrels per day (87,445 cubic meters per day) of diluted bitumen from the oilsands region of Alberta delivered to the site by pipeline or by rail. The diluent will be extracted at the refinery and returned to Alberta if needed there. If not, it would be processed into gasoline. The bitumen will be converted into fuel products, primarily for export. 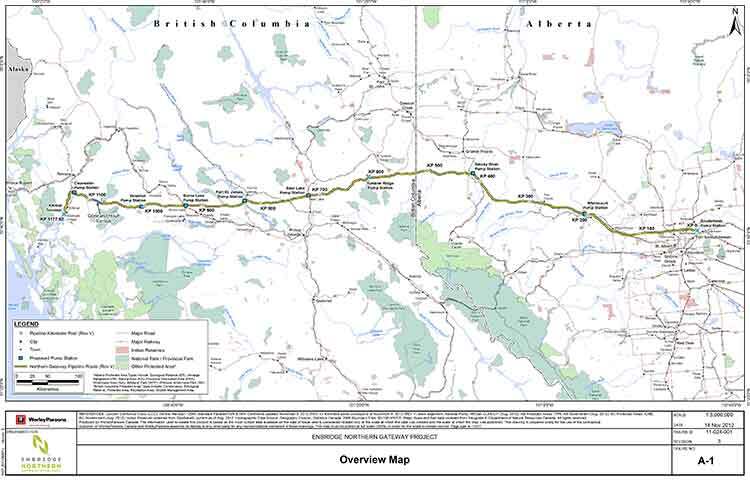 Black’s plans call for connecting the Northern Gateway bitumen Pipeline to the site. From the refinery six dedicated product pipelines will run to a marine terminal on the Douglas Channel. The Douglas Channel is a wide and deep fjord. VLCC (Very Large Crude Carrier) tankers will transport the refined fuels to markets around the Pacific Rim. The US State Department report on the controversial Keystone XL pipeline project also looks at the Kinder Morgan Transmountain pipeline (both the existing line and the proposed second line) and, in at least one part of the report, seems to speculate that, once expansion of the Panama Canal is completed in 2014, there could be larger tankers in Vancouver harbour, something that up until now, both Kinder Morgan and Port Metro Vancouver have denied. However, the State Department report does not say how the port of Vancouver could handle larger tankers. The State Department EIS says if larger tankers were loaded at Vancouver, it could be economic for crude from the Kinder Morgan Transmountain pipeline to be moved to the US Gulf Coast. Using heavy crude as a basis, a present day movement via Trans Mountain to Vancouver and thence on a Panamax tanker via the Panama Canal to Houston would have a total freight cost (pipeline tariff plus tanker freight and Panama toll) of around $8.50-9.50/barrel (bbl). Recognizing that Kinder Morgan plans to enable future shipment in larger Suezmax tankers, and that the Panama Canal Authority is expanding the Canal to take tankers of that size, the rate using a Suezmax would be approximately $1/bbl lower. These rates compare to approximately $8/bbl to move heavy crude via pipeline from Hardisty to Houston. Thus, while in normal markets, a tanker movement from Western Canada would be somewhat more costly than via pipeline, in a scenario where ability to move WCSB crudes by pipeline to the U.S. Gulf Coast were constrained, refiners in the U.S. Gulf Coast could opt for tanker transport. According to the progress report the current Panama Canal has the capacity for ships that are 32.3 metres wide by 304.6 metres long, This will increase to 49 metres wide by 366 metres long. Under this option, WCSB [Western Canada Sedminetary Basin] would be shipped by existing railways or new pipelines from the Hardisty region to Vancouver or Kitimat, British Columbia for shipment by marine transport through the expanded Panama Canal and delivery to Gulf Coast area refiners. This option considers moving up to 730,000 bpd of heavy crude to the Port of Vancouver and then to the marine docks at the Westridge marine terminal in Vancouver or the port in Kitimat. Under this option, crude oil could move either via rail or by a new pipeline from the Hardisty region. Currently, Kinder Morgan is planning an expansion of the existing Trans Mountain pipeline originating at Edmonton, increasing its capacity from 300,000 bpd (current) to up to 890,000 bpd(planned for operations in 2017). The Trans Mountain pipeline runs into Vancouver via the existing Burnaby terminal over to the Westridge dock for loading heavy crude onto vessels. The pipeline has sufficient commitment from shippers to proceed with engineering and permitting processes. Kinder Morgan indicates that the project would significantly increase tanker traffic from about 5 to 34 cargoes per month, or up to about 400 cargoes per year . The increased marine traffic is due to increased volume to be shipped, and lack of sufficient channel draft to load larger vessels. The proposed expansion at Westridge Terminal is based on the loading of Aframax tankers, the same tankers currently being loaded at Westridge. Larger tankers are not permitted in the Vancouver harbour, and are not under consideration for the expansion. Proposed changes at the dock include new loading facilities, fire protection, vapour recovery, secondary containment, and emergency response equipment. To connect the Burnaby Terminal with the Westridge Terminal, the proposed expansion includes two new, four-kilometre pipelines each with a diameter of 762 millimeters (30 inches). These two new delivery lines would provide product deliveries to tankers at two new dock berths, and provide the scheduling flexibility required for a marine operation. The role of Port Metro Vancouver is to conduct a rigorous project review to ensure the safe movement of goods through the Port. Kinder Morgan has yet to submit a formal project proposal to Canada’s National Energy Board. If they do, and should approval be granted, the project would then undergo several other permitting processes, one of which is a Port Metro Vancouver Project Permit Review. Vancouver is a very low volume tanker port. Currently, there are about 100 crude oil and chemical tankers calling the port each year. If the Kinder Morgan project receives approval, that number could increase to approximately 400 tankers a year. Other well-run ports such as the Port of Rotterdam handles 8,206 tankers a year, while Singapore handle 22,280 tankers a year. Will larger tankers be calling at Port Metro Vancouver as a result of the Kinder Morgan Proposal? There are no plans to exceed the current maximum size of tankers calling at Port Metro Vancouver. Due to depth restrictions in the Burrard Inlet, the largest dimension of tanker that can be handled is the Aframax, a medium-sized tanker with a maximum capacity of 120,000 tonnes. Even then, these vessels can load to only around 80% of capacity due to draft restrictions. The State Department EIS was cautious about the Kinder Morgan project and did not do the same deailed analysis as it did for Prince Rupert. The substantial increase in tanker traffic from the proposed Kinder Morgan expansion has raised safety and environmental concerns. Moving additional volumes of crude oil from the proposed Project into the Vancouver market by either a new pipeline or rail would result in 400 or more additional vessels loading at Vancouver each year and would require considerably more storage to be built than the current Kinder Morgan operations. The expansion of storage capacity, potential rail off-loading facilities and logistics, and increased marine traffic may make this option logistically challenging in a relatively compressed and populated geographical area. Moreover, even if a separate pipeline from Hardisty could be planned, mapped, engineered, designed, and permitted starting today, it would likely not be available as an option until well after the proposed [Keytsone] Project’s planned start date. As a result of the logistical challenges in increasing the amounts of heavy Canadian grades of crude oil coming into the Vancouver/Burnaby region over and above the volumes from the Kinder Morgan expansion, this option was deemed to be less viable than movements from Kitimat and Prince Rupert and was eliminated from detailed analysis. It’s not clear from the Keystone EIS, if the State Department was simply speculating on larger tankers in Vancouver harbour or if it was made of aware of possible hopes for a deep water tanker port elsewhere in the Vancouver harbour area. second open season, Kinder Morgan has increased the expansion to 890,000 bpd. The bulk of the incremental crude moved on the line would potentially be destined for Asia. The review process for this project is continuing, but there is significant opposition based on concerns over environmental impacts associated with the oil sands and with additional tanker movements in the Port Vancouver harbor. As noted above, both of these proposed pipeline projects to Canada’s West Coast face significant resistance and uncertainty, but there are strong cost advantages when compared with moving WCSB crude to the Gulf Coast even if rail were used to access the Canadian West Coast... In fact, using rail and tanker to ship crude oil from the WCSB via the West Coast to China is comparable to the pipeline rate to reach the U.S. Gulf Coast. An increase in the transport costs to the Gulf Coast (utilizing alternative transport options such as rail) would have a tendency to increase the economic incentive to utilize any West Coast export options, if they are available. There have always been commentators who believe that if the Northern Gateway Pipeline is rejected by the Joint Review Panel or stopped by other means, that the bitumen from Alberta should be carried by rail to Prince Rupert. A pipeline to Prince Rupert has already been rejected by Enbridge as impractical given the mountainous terrain and the narrow footprint along the Skeena River from Terrace to Prince Rupert. 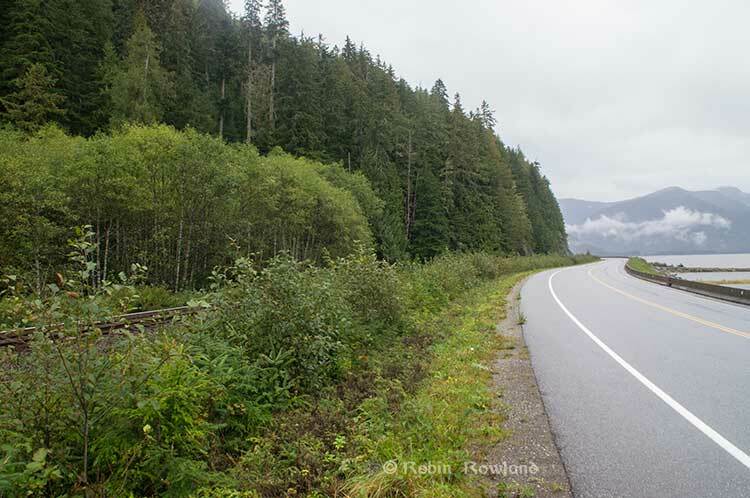 That means taking bitumen by rail to Prince Rupert has not been seriously studied—until now. The State Department Environmental Impact Study (EIS) on the controversial Keystone XL pipeline from Alberta to the US Gulf, does give serious consideration to the rail to Rupert option. The EIS took a brief look at the possibilities of rail to Kitmat, but concentrates mostly on Prince Rupert. As for sending bitumen to the Gulf,via rail and tanker, the Keystone report concludes, as have most analysts that even if bitumen was shipped by rail to Prince Rupert, it would be cheaper to send it to markets in Asia than through the Panama Canal to the US Gulf Coast. If pipelines to the Canadian West coast are not expanded or approved, even incurring the additional cost of rail transport to the West Coast ports (Vancouver, Kitimat, or Prince Rupert), estimated at $6 per barrel, results in a total transport cost to Asia that is still 40 percent cheaper than going via the Gulf Coast. Absent a complete block on crude oil exports from the Canadian West Coast, there would belittle economic incentive to use the proposed project as a pass through. The high costs of onward transport to other potential destinations tend to mitigate against WCSB [Western Canada Sedimentary Basin] heavy/oil sands crudes being exported in volume from the Gulf Coast. • Shipped via Suezmax vessels to the Gulf Coast area (Houston/Port Arthur) through the Panama Canal. New facilities in Prince Rupert would consist of a large rail terminal complex, most likely on themainland, where off-loaded crude oil would be stored until it could be loaded onto tankers, and an expanded port. The entire facility would cover 4,700 acres (1,900 hectares), including 3,500 acres (1,400 hectares) for storage and off-loading/on-loading facilities at the rail terminal and approximately 1,200 acres (487 hectares) of land at the expanded port. • Buildings (control center and civil infrastructure including roads). The scenario calls for adding approximately 13 trains with 100 tanker cars per day on the 1,100 miles (1,770 kilometres) of CN and Canadian Pacific rail lines between Lloydminster and Prince Rupert. If BC remains set against a pipeline the oil will come to the refinery by rail. CN and the oil companies are keen on this. A great deal of crude in North America is being moved by rail now. The costs are not that different in this case and no permits are required. Rail tankering is, however, not as safe and it is more disruptive. Small towns along the route with level crossings would rue having 12 more trains running through every day. The concept of the Suezmax tankers is critical to the west coast, even if none of the scenarios eventually happen, because the State Department report notes that the Panama Canal is now being expanded, so that larger ships, including tankers, can go through the canal after 2014. The current size is Panamax (maximum size for the current Panama Canal) to Suezmax (the maximum size for the Suez Canal), and, according to the State Department that means even if the even bigger Very Large Crude Carriers are not calling at west coast ports, the newer, larger Suezmax tankers may be. It should be noted, however, that if WCSB crude oil reaches a Pacific port, regardless of whether by rail or by pipeline, the economics for movement via tanker would favor shipping the oil to Asia rather than the Gulf Coast area. The cost of transporting crude oil via tanker from Prince Rupert to Houston and Port Arthur is estimated to be approximately $4.70/bbl, whereas the transport cost via tanker from Prince Rupert to refinery ports in Asia (e.g., Ulsan, South Korea and Dalian, China), is estimated to be only approximately $1.70 and $2.00/bbl, respectively. The lower transport cost to Asia versus the Gulf Coast area is attributable to shorter trip duration (30 to 37 days to Asia versus about 45 days to the Gulf Coast area), avoiding the Panama Canal toll(about $0.70/bbl), and being able to use a larger tanker because it would not be constrained by the Panama Canal (a VLCC tanker to China would have a capacity of almost 2 million bbl versus a Suezmax tanker to the Gulf Coast area with a capacity of about 884,000 bbl). So what would happen if there was a scheme to truck bitumen and crude to Prince Rupert and ship via the Panama Canal to the Gulf? the transport of the crude oil via tankers from Prince Rupert to the Gulf Coast area refineries would not have any effects on geology, soils, groundwater, wetlands, vegetation, land use, socioeconomics, noise, or cultural resources, other than in the event of a spill. The Gulf Coast area refineries already receive crude oil shipments via tankers from Mexico, Venezuela, and other locations; the Rail/Tanker Scenario is expected to simply displace these sources of crude oil with WCSB crude oil. Therefore, no new construction or new operational impacts are expected to occur as a result of this scenario at the Gulf Coast area refineries or surrounding habitats or communities. The proposed Northern Gateway terminal at Kitimat, British Columbia was used as a surrogateto estimate the marine facilities needed at Prince Rupert. The Northern Gateway facility isdesigned to handle about 525,000 bpd of crude delivered by pipeline for loading on vessels to theWest Coast and Asia. In addition, it is designed to receive about 193,000 bpd of diluent (a verylight oil obtained from natural gas production) from cargoes arriving by water and discharging into storage at the terminal and moving back to Alberta via a parallel pipeline. The total volumeof about 718,000 bpd approximates the volume of WCSB heavy crude oil that would be loaded at Prince Rupert. At Prince Rupert, depth to bedrock is expected to be relatively shallow, so rock ripping and some blasting could be necessary. The impacts of rock ripping and blasting are limited to the immediate area and would not result in any significant impacts to the underlying or nearby geology. Excavation activities, erosion of fossil beds exposed due to grading, and unauthorized collection can damage or destroy paleontological resources during construction. Construction of the proposed terminals and port expansion in Prince Rupert would result in the disturbance of approximately 3,500 acres (1,400 hectares) of land for the construction of the rail terminal complex and approximately 1,200 acres (487 hectares) for the expansion of the port. Potential impacts to the soils resources of the area could result from vegetation clearance, landscape grading, and recontouring to ensure proper drainage, the installation of storm water drainage systems, construction of the required infrastructure, and other construction activities. One of the primary concerns during construction activities is soil erosion and sedimentation. Potential impacts to soils from erosion are expected to occur in areas where the slopes are greater than 20 per cent and where the erosion potential due to their nature is high. Based on available landscape and soils information, the soils found in the area are not highly erodible and the required infrastructure would be located in areas that are relatively flat. Therefore, the impact of the proposed terminal complex and port construction activities on soil erosion would be minor. The Prince Rupert Terminals and port expansion would occur in British Columbia on Kaien Island, which receives about 102 inches of rainfall per year. The terminals would be located on an inlet that is part of the eastern Pacific Ocean on the Venn Passage near the much larger Inland Passage, which extends from Washington State to Alaska along the islands and mainland of British Columbia, Canada. Venn and Inland Passages are marine (salt water) waterbodies. The islands consist of bedrock (granitic rocks) overlain by glacial outwash and a thin soil cover. Groundwater is shallow, poor quality, and unused. Drinking water is derived from lakes on the mainland. Water quality in the terminal complex area is seawater and inland brackish. During construction of the facilities at Prince Rupert, the primary potential impacts to groundwater would be spills or leaks from construction equipment. Mitigation for these impacts includes having in place appropriate plans in place and appropriate cleanup materials available. During operations of the facilities at Prince Rupert, the primary potential impacts to groundwater would again most likely be spills or leaks from operation equipment or associated with crude oil unloading of railcars. Although the initial impacts of potential releases or spills may be contained or limited to soil, potential impacts to groundwater may occur depending on the depth to groundwater, soil characteristics (e.g., porosity, permeability), spill volume and extent, and whether the spill reaches surface water bodies, some of which are interconnected to groundwater. 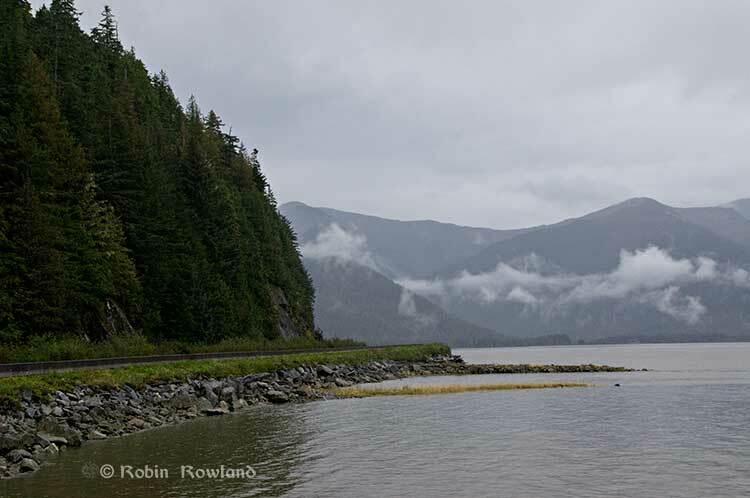 The upland character surrounding the potential Prince Rupert terminal area is dominated by bog forest uplands and the flowing surface water bodies are predominantly precipitation- and shallow groundwater-fed intermittent streams. Some open waterbodies are present in the southeast portion of Kaien Island. Tidal shore zones are of a rugged and rocky nature and receive wave energy generated by naturally occurring fetch and large wakes from marine traffic. Winter winds are strong and from the southeast to southwest, with surface currents predominantly northward from the Hecate Strait. Lighter summer winds have less influence on currents and allow freshwater runoff from land and deep water tidal effects to exert more control and provide variation in summer current patterns. Significant wind and tidal mixing tend to occur where waters are shallow and around islands and rocky points of land. The coastal landscape is predominantly fjords carved into the granitic Coast Mountains, created by the last of several glacial periods approximately 12,000 years ago. Shores tend to be rocky and steep with beaches restricted to sheltered areas adjacent to estuaries and the navigable straits and channels provide a wide variety of exposures and habitats. Construction of the facilities at Prince Rupert would disturb approximately 4,700 acres. The primary potential impacts to surface waters include erosion and sedimentation and spills/leaks of hazardous materials. Mitigation for these impacts includes having in place appropriate SPCC plans in place and appropriate cleanup materials available. During operations, the primary potential impacts to surface waters include storm water runoff, spills, or leaks from operation equipment or associated with crude oil unloading of railcars. Provision of storm water management measures would mitigate the impacts of stormwater runoff. The Prince Rupert terminals and port facilities would be located in the Coastal Gap Level III Ecoregion. The vegetation immediately adjacent to the Pacific Ocean includes stunted, opengrowing western red cedar, yellow cedar, and western hemlock with some stunted shore pine and Sitka spruce . There are also open areas present within the affected areas. 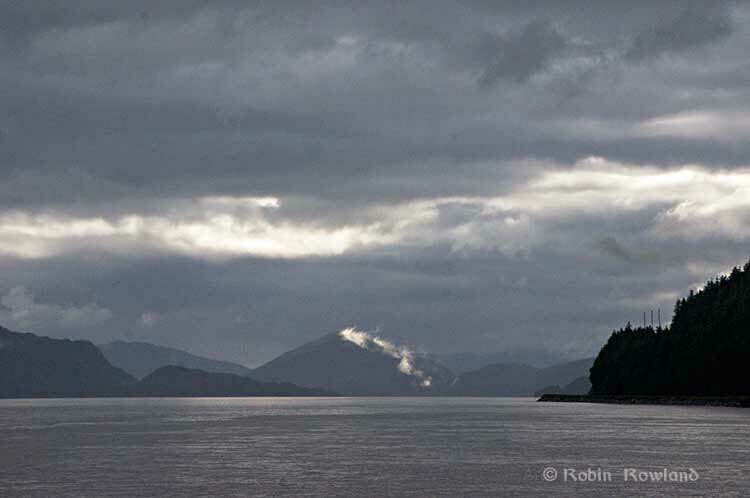 It is unclear if biologically unique landscapes or vegetation communities of concern exist within the proposed Prince Rupert terminal complex boundary. The proposed rail terminal complex and port facilities at Prince Rupert would require the clearing of up to 4,700 acres of natural vegetation, most of which is forested based on aerial photo interpretation. There does not appear to be any biologically unique landscapes or communities of conservation concern within the terminal complex boundary. Nearly all of these impacts would be permanent as natural habitats are converted for use as rail terminals and port facilities. Direct impacts could occur due to vegetation removal or conversion, obstructions to movement patterns, or the removal of native habitats that may be used for foraging, nesting, roosting, or other wildlife uses (Barber et al. 2010). Indirect impacts to wildlife are difficult to quantify and are dependent on the sensitivity of the species, individual, type and timing of activity, physical parameters (e.g., cover, climate, and topography), and seasonal use patterns of the species (Berger 2004). Most of these impacts would be essentially permanent. Prince Rupert is an important deepwater port and transportation hub of the northern coast of British Columbia. It is located on the northwest shore of Kaien Island, which is connected to the mainland by a short bridge. The town of Prince Rupert is just north of the mouth of the Skeena River, a major salmon-producing river. Key commercial fisheries include Pacific salmon, halibut, herring, and groundfish, which are processed from Prince Rupert. 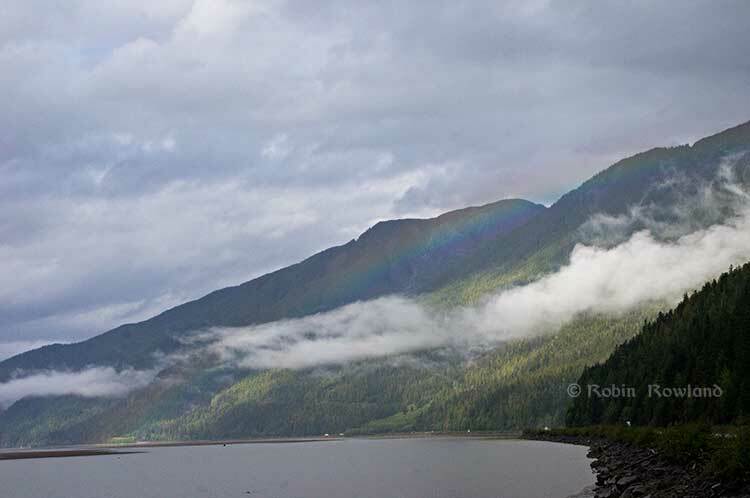 Prince Rupert area supports a high density of streams and rivers that host an array of valuable recreational fisheries for salmon, steelhead (anadromous rainbow trout), rainbow trout, lake trout, cutthroat trout, char, Arctic grayling, and northern pike . fish (i.e., halibut, flounder, and rockfish) and marine invertebrates (i.e., clams, mussels, crabs, and other bivalves and crustaceans) could potentially be impacted during construction as well, but these affects are expected to be minor and temporary or short-term in duration. Additional shipping traffic would increase underwater sound because large vessels, including tankers, put out relatively high noise levels. Fish and other aquatic organisms (including invertebrates and marine mammals) use sound as a means of communication and detection within the marine acoustic environment. Increased shipping traffic could mask natural sounds by increasing the ambient noise environment from Prince Rupert Harbor and along the marine route to the Gulf Coast area. Long-lasting sounds, such as those caused by continuous ship operation, can cause a general increase in background noise and there is a risk that such sounds, while not causing immediate injury, could mask biologically important sounds, cause hearing loss in affected organisms, and/or have an impact on stress levels and on the immune systems of aquatic species. Exotic and invasive species are sometimes transferred in the ballast water of tanker ships. Monitoring and controls would need to be implemented to treat ballast water discharged into Prince Rupert Harbor such that invasive or exotic species would not be released into the marine environment. The green sturgeon is typically found along nearshore marine waters, but is also commonly observed in bays and estuaries. The expansion of the proposed port facility could have minor adverse effects on the green sturgeon, but the sturgeon could readily avoid the port area. tanker traffic could also increase the potential for collisions between marine mammals and shipping vessels. These effects would be additive in nature and could potentially add to existing disturbance effects and collision risks caused by the current level of shipping traffic, commercial and recreational fishing, and cruise ship passage. Land use, recreation, and visual resources for the Prince Rupert area where the new terminals and expanded port facilities would be built differ sharply from the other terminal sites. Prince Rupert is located on an inlet of the Pacific Ocean in a heavily forested area of British Columbia. Urban land use is generally limited to the communities in and around the city of Prince Rupert, with some small outlying communities and villages in the area. Given Prince Rupert’s role as a terminus of the Alaska Ferry System, many people see the port and surrounding areas in a recreational context. The area is largely undeveloped and would be sensitive to changes in the visual landscape. If constructed on previously undeveloped land, the new facilities would primarily impact mixed forest… The construction and operational impacts on land use, recreation, and visual resources at the Lloydminster, Epping, and Stroud terminal complex sites and along the Cushing pipeline route would be the same as for the Rail/Pipeline Scenario. Tanker infrastructure and operations would be affected as ships transport crude oil from Prince Rupert through the Panama Canal to Texas ports near Houston. Despite the large population of First Nations people in the Prince Rupert area, Canada does not have a similar definition to minorities as the Keystone report applied under US law and so it notes “Impacts to minority and low-income populations during construction and would be similar to those described for the proposed [Keystone] Project and could possibly result in increased competition for medical or health services in underserved populations. Canada does not define HPSA and MUA/P, so it is unknown whether or not the minority populations in Prince Rupert or Lloydminster exist in a medically underserved area. It says construction of a new terminal Prince Rupert would generate provincial sales taxes, goods and services taxes, and hotel taxes. Construction of the tank and marine terminals at Prince Rupert…would involve large numbers of road trips by heavy trucks to transport construction materials and equipment to and from the sites. Construction in Prince Rupert could also potentially involve vessel deliveries of material. This traffic could cause congestion on major roadways, and would likely require temporary traffic management solutions such as police escorts for oversize vehicles. No cultural resources studies have been conducted for the Prince Rupert area. Review of aerial photographs shows that a small portion of the area that could potentially be developed has already been disturbed by development, including port facilities, structures, and roads. This preliminary review shows that most of the area appears undeveloped and would have the potential for intact buried cultural resources. include intact buried cultural resources would require evaluation through research and cultural resources surveys. If cultural resources were identified, follow-up studies could be required. In general terms, the archaeological potential of heavily disturbed areas, such as might be found in active rail yards or within developed transportation corridors, is normally lower than in undisturbed areas. Archaeological potential is also contingent upon factors such as access to water, soil type, and topography, and would have to be evaluated for each area to be disturbed. Aboveground facilities have the potential to indirectly impact cultural resources from which they may be visible or audible. The potential for increased rail traffic to contribute to indirect impacts would require consideration. On an aggregate basis, criteria pollutant emissions, direct and indirect GHG emissions, and noise levels during the operation phase for this scenario would be significantly higher than that of the proposed [Keystone XL] Project mainly due to the increased regular operation of railcars, tankers, and new rail and marine terminals. vary by transportation segment, particularly during marine-based transit. Oil tankers traveling from the Prince Rupert marine terminal through the Panama Canal to Houston/Port Arthur pass through several different operational zones, including reduced speed zones leading into and out of the ports, North American Emission Control Areas where the use of low-sulfur marine fuel is mandated, and offshore areas where the tankers travel at cruise speeds. During the return trip, tankers are filled with seawater (ballast) to achieve buoyancy necessary for proper operation, which affects the transit speeds of the vessel. Furthermore, the tankers spend several days loading or unloading cargo at each marine terminal with auxiliary engines running (an activity called hoteling). The tanker emissions accounted for return trips (i.e., both loaded cargo going south and unloaded cargo going north). Direct emissions of GHGs would occur during the construction and operation of the Rail/Tanker Scenario. GHGs would be emitted during the construction phase from several sources or activities, such as clearing and open burning of vegetation during site preparation, operation of on-road vehicles transporting construction materials, and operation of construction equipment for the new pipeline, rail segments, multiple rail and marine terminals, and fuel storage tanks. Due to limited activity data, GHG emissions from construction of the Rail/Tanker Scenario were not quantified; however, these emissions would occur over a short-term and temporary period, so construction GHG impacts are expected to be comparable to the proposed [Keystone XL] Project. During operation of the railcars and tankers that comprise this scenario, GHGs would be emitted directly from the combustion of diesel fuel in railcars traveling over 4,800 miles (7,725 km) and fuel oil in marine tankers traveling over 13,600 miles (21,887 km) round-trip. of the proposed Project. During operation of the railcars and tanker ships that comprise this scenario, noise would be generated from the locomotives, movement of freight cars and wheels making contact with the rails as the train passes, train horns, warning bells (crossing signals) at street crossings, and tanker engines during hoteling and maneuverings at the new rail and marine terminals in Prince Rupert. The Keystone study looks at the affects of climate change, but concentrates largely on the Gulf Coast beause the most of the Rail/Tanker Scenario was outside of the boundaries of the study, but it does note that the sea levels are projected to rise due to glacial melting and thermal expansion of the water. The rate, total increase, and likelihood of the rise is in part dependent on how rapid the ice sheets warm and is a source of ongoing scientific uncertainty. The United States Global Change Research Program (USGCRP) estimates that sea level rise could be between 3 to 4 feet by the end of the century. Increasing sea level projected due to climate changes as described above shifts the impact of mean high tide, storm surge, and saltwater intrusion to occur further inland and this would negatively affect reliable operation of the port infrastrucure for tanker traffic. Mitigation of these climate effects could be addressed by making engineering and operational changes at the port. transport. However, the risks and consequences for using oil tankers to transport the hazardous materials are potentially greater than the proposed Project. Overall, crude oil transportation via oil tankers has historically had a higher safety incident rate than pipelines for fire/explosion, injuries, and deaths. • Hull failures: loss of mechanical integrity of the external shell of the vessel. From 1970 to 2011, historical data shows that collisions and groundings were the maincauses of oil tanker spills worldwide. Loading and unloading of the railcars at tank farms near seaports could allow spills to migrate and impact seawaters and shorelines. However, the loading and unloading are generally carried out under supervision and would be addressed promptly by the operators, limiting the potential migration and impacts of the spill to the immediate area. A release of oil at sea would be influenced by wind, waves, and current. Depending on the volume of the release, the spreading of oil on the surface could impact many square miles of ocean and oil birds, fish, whales, and other mammals and could eventually impact shorelines. Oil would also mix with particulates in sea water and degrade. As this occurs some oil will begin to sink and either be retained in the water column (pelagic) or settle to the ocean floor (sessile). Pelagic oil could be consumed by fish or oil fauna passing though the submerged oil. Sessile oil could mix with bottom sediment and potentially consumed by bottom feeding fauna. Spills in ports-of-call could affect receptors similar to an open ocean release but also could temporarily affect vessel traffic and close ports for cleanup activities. The identification of key receptors along the rail route alternative was not available for this evaluation. Therefore a comparison to the proposed project was not completed. moisture traveling from the west towards the east. River systems in this region are supplied by a combination of seasonal rainfall, permanent snowfields, and glaciers. result in permanent impacts to wetlands if passing lanes were constructed where wetlands occur. However, as there is some leeway regarding the exact location of the passing lanes, it is expected that wetlands would be avoided by design. The Rail/Tanker Scenario railroad route would cross numerous major streams and rivers in Canada, many of which support anadromous fish species such as salmon. Anadromous species are those that spawn and rear in freshwater but migrate to the ocean at a certain size and age. Pacific salmon are large anadromous fish that support valuable commercial and recreational fisheries. Commercial fisheries for salmon occur in marine water and most recreational fishing for salmon occurs in freshwater. Salmon eggs are vulnerable to the effects of fine sediment deposition because female salmon deposit their eggs in stream bed gravels. Despite this vulnerability, the overland railway route is not expected to present any new impacts to salmon unless there is a spill into its habitat, although the risk of spills does increase under this scenario due to the increase in the number of trains that would use the route. Potential new impacts under the Rail/Tanker Scenario on commercially or recreationally significant fisheries along the route would be minor because the railroads that would be used are already built and in operation. However, the risk of an oil spill or release of oil or other materials still exists. The tanker portion of this route scenario is also subject to oil spill risk. The rail route would cross over the Rocky Mountain region of western Alberta, which is inhabited by species such as the woodland caribou (Rangifer tarandus) (a SARA threatened species) and grizzly bear (a SARA special concern species). This region of British Columbia is home to a number of SARA threatened/endangered species, including the peregrine falcon (Falco peregrinus anatum) (SARA threatened), salish sucker (Catostomus sp.) (SARA endangered), white sturgeon (Acipenser transmontanus) (SARA endangered), caribou (southern mountain population) (SARA threatened), northern goshawk (Accipiter gentilis laingi) (SARA threatened), and Haller’s apple moss (Bartramia halleriana) (SARA threatened). A number of additional SARA special concern species inhabit the regions of Canada that would be traversed by the Rail/Tanker Scenario, including but not limited to those special concern species expected to occur in the Prince Rupert region, and discussed above (B.C. Conservation Centre 2012).